This past weekend, Ed and I went to Flagstaff, Arizona so he could ride his new Kawasaki KLR 650 in the Mountain Madness 2017 event sponsored by the Coconino Trail Riders. Ed, prior to getting suited up in all his riding gear. It was a two-day Dual Sport ride in the mountains of Northern Arizona, 7,000+ feet high. They offered A, B, and C adventure routes. The A and B routes are the most challenging, the C routes a little easier and mostly designed for bikes bigger than 650cc. Ed fell into the C category because of his bike and because he was new to this kind of trail riding. Below you can see a map of Ed's ride. 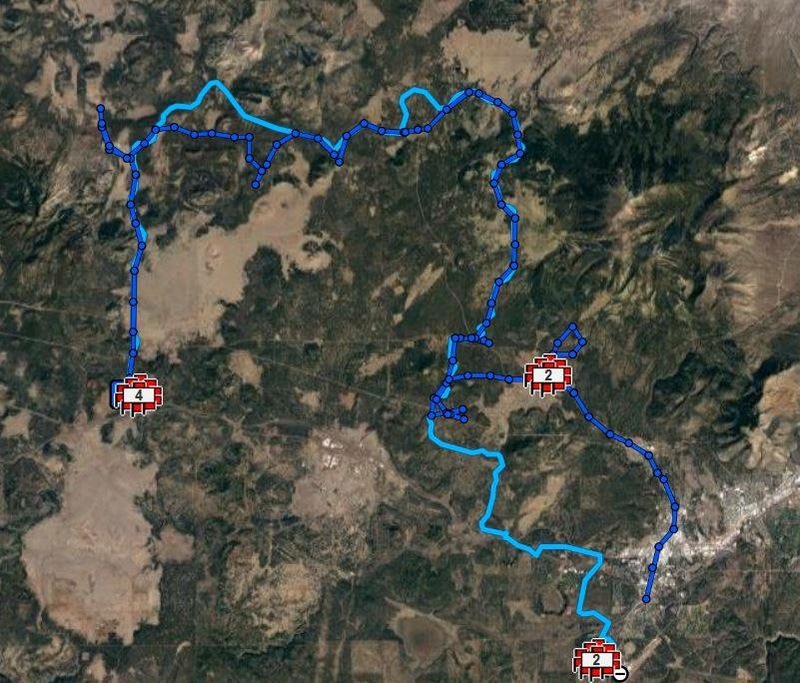 The light blue line is the route as it was shown in the GPS, according to the GPS tracks given to him by the rider organization. The dark blue line is the route Ed actually wound up riding. In some areas he decided not to follow the course, in others he got sidetracked and got off course. 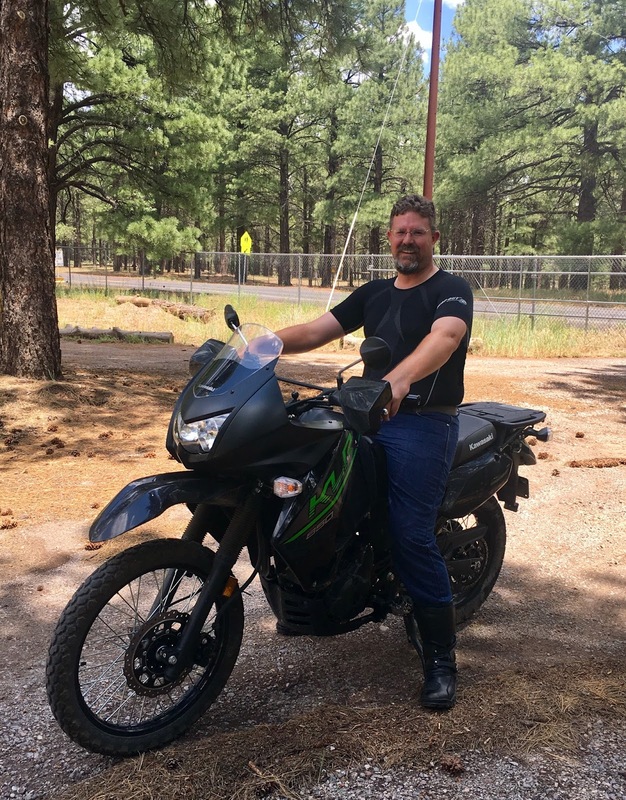 The ride was scheduled for Saturday and Sunday, with two breakfasts, lunches, and one dinner provided. 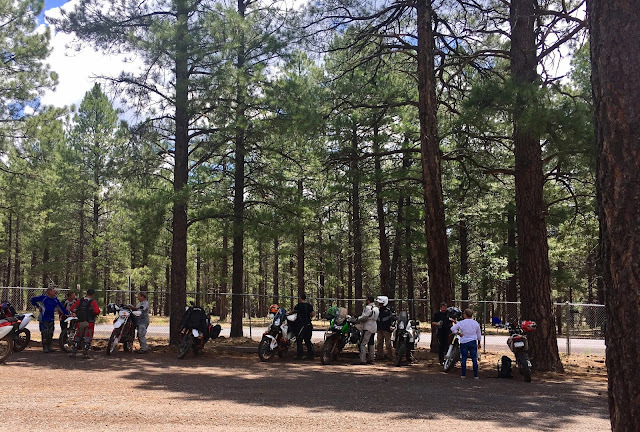 Saturday was an all day event, ending with a dinner for all the riders, and Sunday's ride ended by 2 p.m. Ed only participated in Saturday's ride. The area is very pretty, with pine trees lining the back roads and lots of pleasant scenery. At one point, Ed ventured off the C route and wound up on an A route. He shot some video of his ride and I've got to say, the A route looked a little hairy! Very rocky, very narrow. Much more suited for the bikes in the photo below than the one Ed was riding. But he made it through. Yay, Ed! He liked it so much that I know he plans to do more riding in the future. Southern Arizona has a lot of desert and dirt, and I'd imagine it gets a little boring after a while looking at the same thing for miles. The northern part of the state has scenery I'd find a little more appealing to ride through. But I'm not riding, right? 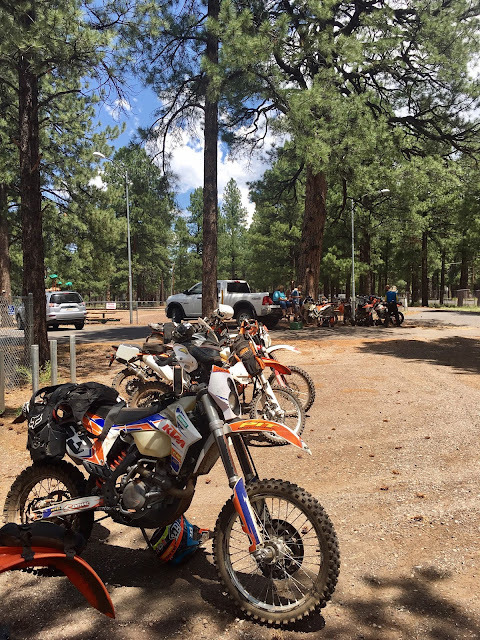 If you're interested in this kind of riding, you can find dual sport events nationwide through this website.